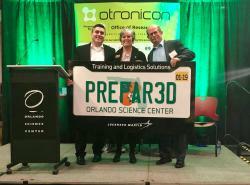 Lockheed Martin Vice President of Engineering & Technology Tom Mirek and Prepar3D Engineering Project Manager Adam Breed present Prepar3D licenses to Orlando Science Center CEO JoAnn Newman at the 14th annual Otronicon commemorating the donation. ORLANDO, Fla., January 22, 2019 /3BL Media/ - Lockheed Martin (NYSE: LMT) donated Prepar3D licenses valued at more than $32,000 to the Orlando Science Center kicking off the annual Otronicon conference furthering science, technology, engineering and mathematics (STEM) education in the Central Florida community. Prepar3D is Lockheed Martin’s visual simulation platform allowing users to create training scenarios across aviation, maritime and ground domains. Prepar3D engages users in immersive training through realistic environment ideal for commercial, academic, professional and military instruction. The software is used to train pilots on platforms from general civilian prop planes to fifth generation fighter jets. For additional information visit: www.prepar3D.com or www.osc.org/otronicon/.